Sometimes here at Roger Oates, we are lucky enough to be involved from the very early stages of a home renovation project. Such projects really excite us as we get to work closely with our client striving to find the perfect runner to match their new home. We are also able to watch and share in their excitement as their vision comes to fruition. 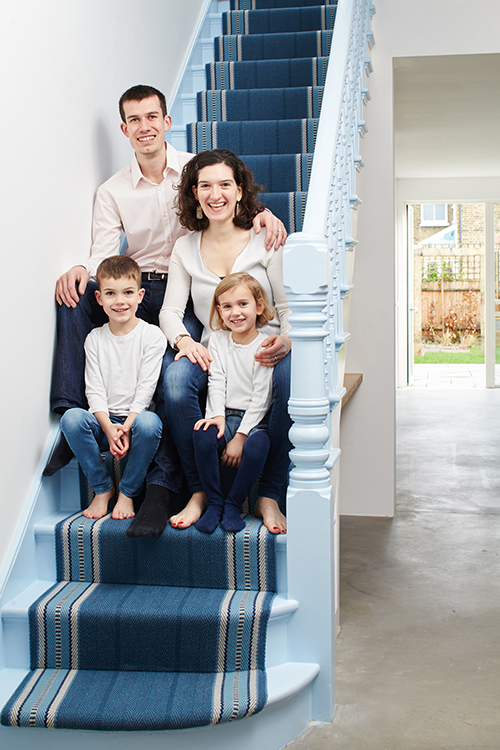 Here, we bring you one such project; the impeccable London home of Madeleine and Ian has been a labour of love with every element overseen by Madeleine. As parents to a young family they wanted a practical home to raise their children but they didn’t want to compromise on style. We knew that with their new open plan layout and industrial chic elements (hello concrete floor) that our new Indigo Westport runner would work wonderfully with what they wanted to achieve, we are so pleased that they felt the same. Here Madeleine talks about her home, her style inspirations and what brought her to Roger Oates. My vision when designing and decorating our home was for it to be playful and colourful with lots of fun design elements, whilst still being totally practical and not at all gimmicky. I wanted to create a welcoming family home that would be able to accommodate our needs as our family grows up. How does your Roger Oates runner compliment your home style? 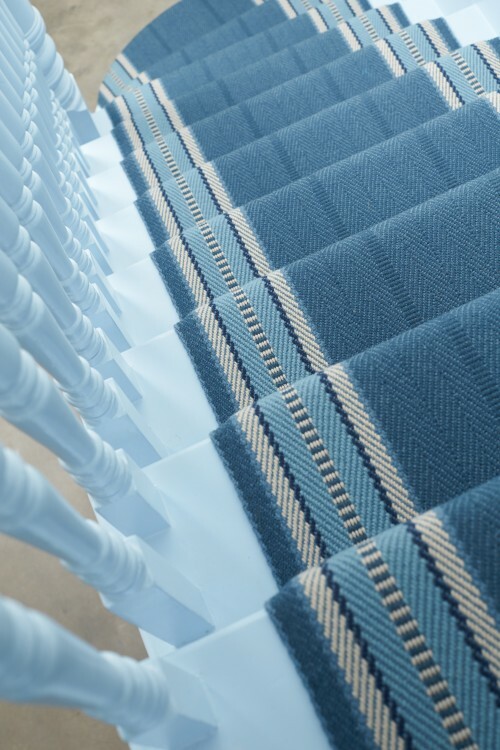 The stair runner has a real elegance to it, whilst still providing colour and intrigue. I love the fact that it looks simple from afar, but as you get closer you realise it is a work of art and the detail is exquisite. In this house I only brought and bought things I really loved and that were good quality and would stand the test of time, and the stair runner definitely meets that criteria. Where do you go to seek decorating inspiration? I have to admit I love design magazines and currently have subscriptions to Living Etc and Elle Decoration. I also became quite addicted to Houzz whilst renovating the house! Why did you choose this particular Roger Oates runner? I chose a blue runner to go with my navy blue kitchen, which you can see when looking at the stairs. I chose a design with a border as I find it helps to frame both the runner and the stairs better, and I love the herringbone detail in the middle. It’s so subtle, but really makes a difference. My kitchen. I used to have a small kitchen where things fell on my head when I opened the cupboard doors! Now I have a lovely big kitchen with a store room – it’s such a luxury, which I appreciate every day, many times a day! Why did you choose a Roger Oates runner? Our staircase is straight in front of you when you come through the front door, so it felt right to have something fantastic on there to greet you! A friend recommended Roger Oates to me, and I instantly fell in love with their designs and quality. 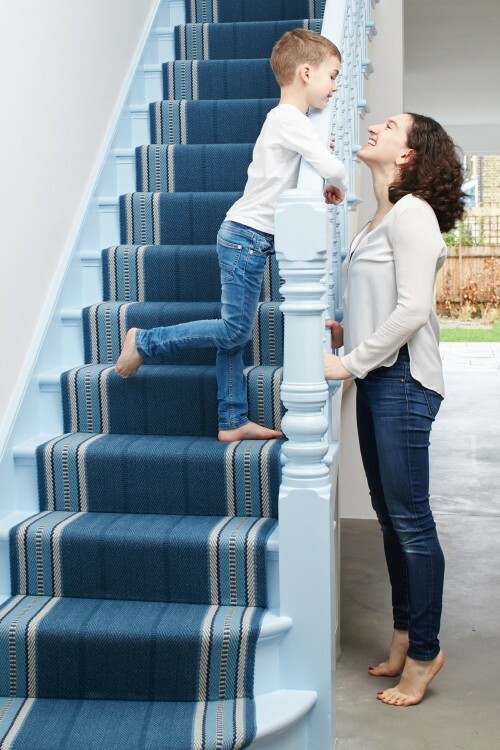 Madeleine’s runner is Westport Indigo Flatweave, just one of the 9 new colours in the New England Collection. Expertly fitted by us, and project managed by our London showroom – reach them on 0207 351 2288. If like her you are addicted to Houzz, we’d recommend taking some time to look at the Roger Oates page.